The rhythm and puzzle genres both adopt the old "easy to learn, impossible to master" mantra on a regular basis. Unlike strategy or fighting games where learning laws and manipulating dozens of variables is the key to victory, these genres often boil the core concepts down to become palatable for the masses. There’s still some depth, but that barrier to entry is shattered. 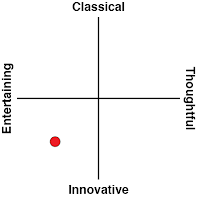 It's disappointing, then, that more titles don’t interlace rhythm and puzzle elements in a complementary fashion. These games are out there, sure - look no further than the Lumines series - but whenever you stumble upon a title that executes the fusion competently, it's a rare treat. Thankfully, Akihabara - Feel the Rhythm is a melodic morsel that will satiate that appetite. It might not set your heart ablaze based on a thirty second trailer that fails to depict its understated charm, but rest assured it delivers. Like the aforementioned Lumines, this is a falling block puzzler with something extra lurking in the background. The central goal is a familiar one: clear as many descending blocks as possible by matching identical colours or shapes in a row of three or more (depending on the selected difficulty). The twist is that you're rewarded for tapping along on time with the music. A pulsating bar overlaid atop the notes represents the timing and which blocks will be affected when the screen is tapped. If you want to rack up a good score, just chaining together combos and surviving an onslaught of blocks will not cut the mustard. Of course, the rhythm element would falter if not for background tunes to punctuate the experience. The game delivers various electronic jams that typically opt for a subdued backbeat and an atmospheric, calculated groove. Unlike many popular rhythm games, these are all composed by a single (and clearly talented, I might add) artist rather than the likes of AKB48 or Aira Mitsuki. The soundtrack is going to be hit or miss entirely depending on one's musical taste, naturally. That said, I found myself pivoting from blasé to utterly entranced with great haste. Nonetheless, I can see how some players would feel out of their element due to the lack of more upbeat pop or vocal pieces.. The 15 or so tracks on offer are stylistically diverse but not so overtly that those unfamiliar with EDM will pick up on their subtleties; some will find they meld together. To that crowd, I'd argue Akihabara's choice of musical genre and overall consistency is by design. A glance at the game's title, the idol mascot plastered all over the game, and the flashy aesthetics are all the tip-offs you need to suspect that this game is trying to evoke the sensation of a trip to Akihabara. Whether this type of music is more relevant to modern day Akihabara than J-Pop sung by various idols is an interesting discussion, but you can tell what the developer was out to accomplish. The game also achieves a feeling of hustle and bustle through its imagery. Yes, the motif carries over to all aspects of the game while actually playing it. While Lumines was a vibrant game indeed, Akihabara pushes for even more kaleidoscopic palette choices, flashing lights, and trippy transitions from song to song. 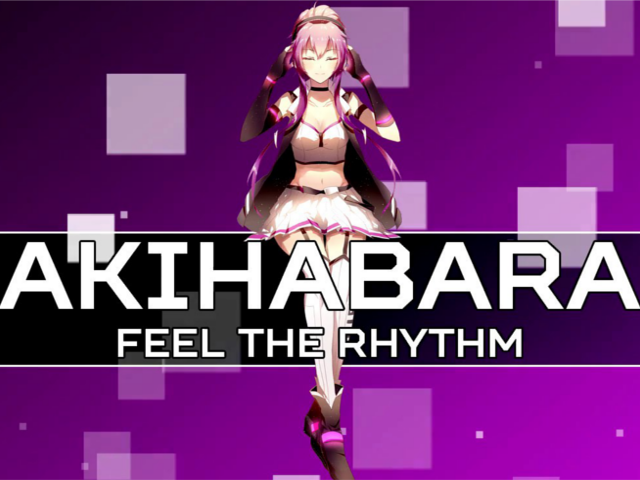 With minor exceptions such as remixes, every song in Akihabara – Feel the Rhythm has the game taking on completely different aesthetics and, as a result, emotions. One track might have you matching basic geometric shapes on a backdrop of Akihabara architecture until suddenly you’re throwing down X and O blocks on an idol’s stoic visage. Indeed, the falling blocks you’re playing with change appearance while you’re moving them with no time for a breather. I’d be lying if I said some of these effects weren’t jarring, but adapting to the abrupt changes and quirks is almost part of the fun. The game very much feels “alive” whereas others come off as static; their presentations are just a means to an end. There are some other distractions here such as the obligatory achievements, leaderboards, and a mode for playing your favourite tracks. Akihabara’s real allure, though, is all contained within its main two arcade-like modes that last for either a defined 15 or 30 minutes. Just the way each song transitions so seamlessly from one to the next is something to behold. There’s a measurable ambition here sorely missing from the thousands of match-three puzzle games available on the App Store. What could have been a serviceable little Lumines clone unexpectedly establishes a new formula that pays homage. Whereas those games tend to be crammed with towers of blocks spanning both vertical and horizontal areas in the field of play, this one is quite consolidated. Thus, Akihabara becomes more rapid fire and unpredictable, making it perfectly suited for one type of game the iPhone format is known for: pick up and play. To simply alter the playing field's size would be an obvious tweak that conveniently happens to alter gameplay, though, so it's fortuitous that there's more than that. The player exhibits agency here not just by physically manoeuvring the blocks around the space but by tapping them. This again sounds like a minor distinction, but it means that players are not just rewarded for timing screen taps; they're at the mercy of the beat itself more than ever. Most crucially, the fact that you’re constantly swapping out pieces and not simply arranging them demands a level of strategy. One botch can have serious ramifications several minutes as you desperately cling to life. Fortunately, a minimalist one touch control scheme ensures you're mentally stimulated but never physically overwhelmed since the pace you need to move at is constant. If there’s a definitive criticism here, it’s that Akihabara shines its brightest when tackled in long sessions, yet the size constraints of the playing field impair that. One mode lets you continue infinitely, but the game’s play area seems blatantly designed around shorter sessions. This is alleviated by a rhythm-triggered power-up that can destroy many pieces at once, but it’s hard to shake the feeling that an 8x4 grid is a tad restrictive compared to the Tetris and Dr. Marios of the world. For all its embellishments, Akihabara - Feel the Rhythm is still a humble match-three puzzler at its core. 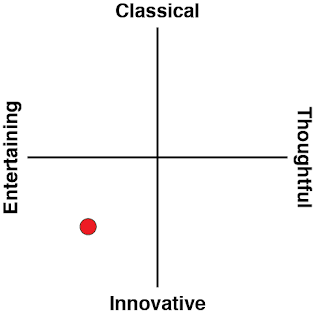 That’s ultimately fine with me because it injects variety and atmosphere into a relatively stale format. “Feel the Rhythm” might sound like a pretentious subtitle at first, but once you realise how the aesthetics, gameplay, and soundtrack all work in tandem to create ambiance, you’ll be feeling it for weeks.